This is not my favorite phrase, mainly because I only think about it when I am sick. In Southern slang, sick as a dog is just our unique way of saying that someone is really sick. As I am sitting at home in bed for third day in the row (I’m on day two of missing work, I’m not a fan). I couldn’t help but wonder, why on earth do we say “as sick as a dog?” I mean, that is a weird phrase right? So, I turned to the trusty source of most quick reference: GOOGLE. Type ” where did the phrase he’s as sick as a dog come from” into the search box and came up with a lot of results, surprisingly. According to the wisdom of everyone else out there in the world that shares things on the internet, the phrase goes back to the 1700s. And apparently using the word “dog” to describe bad things is pretty common. I mean think about: dog days of summer, dog tired, hair of the dog, etc. I mean really, it is used a lot. Apparently the “as sick as a dog” comment refers to the fact that dogs will eat just about anything and can often get super sick as a result. 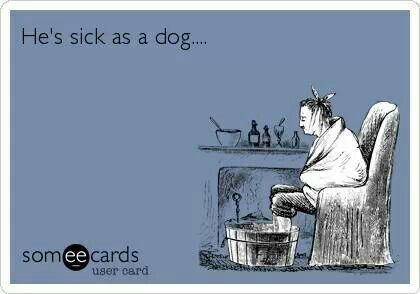 And that is why we say as sick as a dog. Who knew? So, I’m curled up here in my bed, as sick as a dog. I don’t like colds… the coughing, the stuffy noses, the massive pile of tissues in the trash can. My whole house smells like disinfectant spray at this point and I’m sick of chicken soup. Here’s to feeling better soon!